14.5" x 17.2" x 1.7"
Other Thoughts: Works with a X10SLL+-F mobo from Supermicro. Pros: Nice, no frills 1U case. Cons: Hard drive(s) screw in from the bottom. No problem with that but it's at a slight angle so I'd recommend hooking up your power and data cables before screwing it down. No USB ports on the front of the case. Other flavors of the SC512 do have them though. 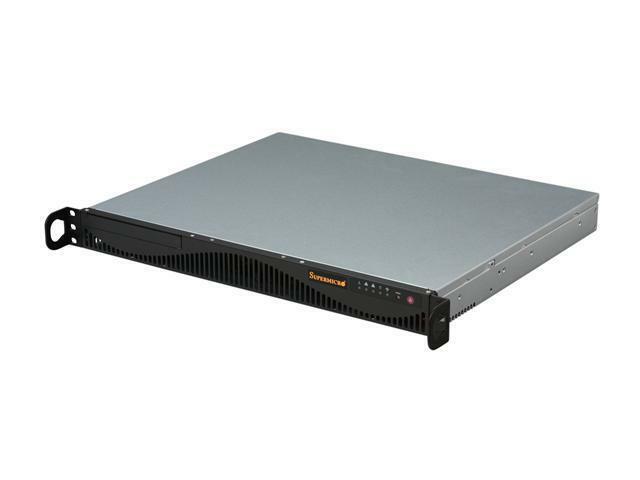 Also, no rack mounting hardware included whatsoever, however they can be ordered separately or like above, other SC512 models include rails. Not a con for SuperMicro, but Newegg should stock the proprietary powersupplies that SM cases use. They can be difficult to find and when you do, the prices are higher than what I'm sure the Egg would charge. If they sell the cases, they should sell the supplies. That said, I've yet to have one fail on the 30+ servers I've built with SM chassis. Does not include the break-out connector for the front panel cable as many SM chassis' do. It's nice when/if using a non-SM motherboard. Other Thoughts: Just keep in mind that this, and all 1U cases, use proprietary sized powersupplies. The cost of a replacement supply is not much cheaper than the entire chassis. Also, it should be noted that this case is designed for use with certain SuperMicro motherboards. Others will work but the 24-pin and 8-pin ATX12V connector may not reach unless the connectors are right along the side of the board - you may need to purchase extension cables for both.